We will begin this exercise from the GAUSS Edit Page. Navigate to the Edit Page by clicking the Edit tab on the left of the application. If the Program Input/Output window is not open on the Edit Page, you may open it from View menu at the top of the Edit Page. From the main application menu select File > Open File. From the main application menu select File > Recent Files. The Run button is located on the main application toolbar. There are two ways to use the Run button. You may either click the Run button directly or choose from a list of files to run by selecting the downward-pointing triangle to the right of the Run button. If you select the downward pointing triangle, you will see a list of files followed by the final option which is Current File. These are the files that you have most recently run. The last file that you ran will be at the top of the list. Selecting Current File will run the last file that your cursor was in. Hovering over the Run button will provide a tooltip with the name of the file at the top of the list. This list of files is called the Action List. The two buttons to the right of the Run button, the Debug and Edit buttons, operate on the same list of files. If your example file has not been run, place your cursor in the file and select Current File from the Run button's Action List menu. When the program begins, you will see a message on the bottom left of the status bar, Running. This message will be followed by Program Finished at the conclusion of the program run. The CTRL+R hotkey performs the same action as selecting Current File from the Run button action list. into the Program Input/Output window. This will save the contents of the matrix x to a file named x.fmt in your current working directory. 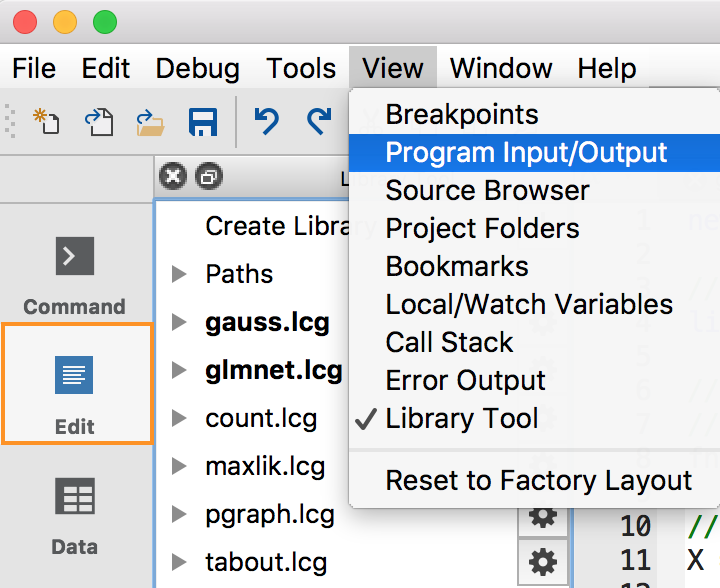 GAUSS's current working directory is indicated by the current working directory combo-box on the main application toolbar. This will create a new matrix named x in your GAUSS workspace with the contents of the file x.fmt that was saved on disk. If you would like to save your variables to a specific location rather than the current working directory, you may set a save path. You may either set a global save path or a local save path. After executing that command, all future variables saved with the save command will be saved in C:\gauss19\data.